Dynamic stretches are a great way to limber up your body before exercise. They get everything warm and loose, and prep your body for movement. Sometimes called 'mobilization', 'active stretching', and 'mobility drills', dynamic stretching exercises put a premium on moving a joint through its entire natural range of motion. More and more often they are used as part of sports warm-ups. So, How Do You Stretch Dynamically? Strictly speaking, any stretching exercise that involves movement can be called dynamic stretching. Thus, ballistic stretching, AI stretching, and many other types of stretching exercises are technically different kinds of dynamic stretching. However, when most people say 'dynamic stretches' they mean gradually moving a limb through its entire range of motion- rather than stretching a specific muscle or muscle group. These are usually a sport- or activity-specific movement to limber up the body for doing that activity after your stretching. For playing tennis you might practice tennis swings without the racket, gradually increasing their speed. For sprinters, a walking knee lift stretch of gradually increasing speed would be good - till you're running. You can create your own stretches just by looking at the activities you already do and using their movements. There are tons of arm swing, kick, and back bend variations you can do with this. The idea behind dynamic stretching is that when a limb is at one extreme of your range of motion, some muscles are contracted as much as possible and others are relaxed. And when you are the other extreme, the muscles that were contracted are now relaxed and vice versa. So, say you're doing arm swings to prep for baseball, kendo, or powerlifting. As your shoulder moves through its complete range of motion, all the rotator cuff muscles are alternately contracted and then relaxed (stretched) in 1 arm rotation. Thus, swinging your arm in circles from the shoulder stretches all the rotator cuff muscles. Dynamic stretches are not effective for increasing your range of motion. So, if you're trying touch your toes don't try these to get closer. However, dynamic style stretching exercises are great as a warm-up before a sport or activity! They move your limb through the range of motion that you will be using in the activity, and they hit more than one muscle at a time - making them extremely efficient time-wise. Also, they work great when used to complement regular static stretching routines. Just make sure that the movements you're doing are similar to the activity you're going to be performing, so that the warm-up warms up the right parts of your body. The movements that you do should mimic the exercise/activity/sport you are warming up for. Never compromise your sports technique for these drills. You are not looking to be completely limp-noodle relaxed. Rather, use your muscles to move the limb through its entire range of motion. Gradually increase the speed of your movements - without bouncing. Never move your joint beyond its natural range of motion or try to bounce to stretch further. That is counterproductive for dynamic stretching and becomes ballistic stretching. Do them for about 10 - 15 minutes to get a good warm-up and get ready for your activity. You can use these guidelines for circular arm swings, straight-leg kick swings, clapping your hand together at arms-length in front of your body and then spreading your arms as far as possible, etc. 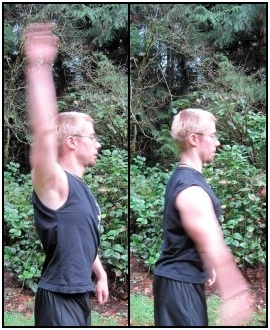 Any limb that you can move freely can be moved for dynamic style stretching exercise. • Click here to leave 'Use Dynamic Stretches To Get Great Results' & go back to the Home-page! 1. Muscolino, Joseph E. 2008. The Muscle and Bone Palpation Manual With Trigger Points, Referral Patterns and Stretching. Mosby Inc. Pp. 61. 2. Deuster, Patricia A., Anita Singh, and Pierre A. Pelletier. 2007. The U.S. Navy SEAL Guide to Fitness and Nutrition. New York: Skyhorse Pub. Pp. 113. 3. Baechle, Thomas R., and Roger W. Earle. 2008. Essentials of Strength Training and Conditioning: National Strength and Conditioning Association. Champaign, Ill: Human Kinetics. Pp. 300. 5. Chabut, LaReine, and Madeleine Lewis. 2007. Stretching for Dummies. Chichester: Wiley. Pp. 15. 6. Walker, Brad. 2007. The Anatomy of Stretching. Chichester, England: Lotus Pub. Pp. 24.